Wood Library Track Ladder - Oak The Cotterman #1 Straight Side Oak Track Ladder has been in use since the 1920’s. 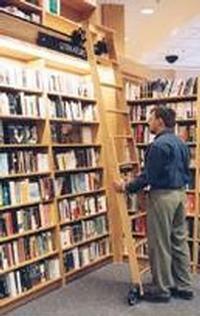 In this time Oak Track Ladders have adapted to many applications, the most common being bookstores, libraries, and shelving access for retail stores. The furniture grade quality appearance adds to the appeal of the ladder, especially in home libraries and retail floor environments. In addition, many other wood selections are available, as well as various stains. 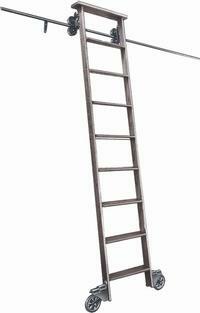 Dimension and Installation Characteristics Overall width of ladder is 16", approximately 28" across bottom wheels. Angle with floor is 80º. Ladders are mannufactured to exact track mounting height required. The track is normally placed in line with a shelf no more than 3 feet below the top of the highest merchandise to be reached. Track heights above 13' 6" are not recommeneded. Aisles greater than 36" wide generally require ladders on both sides of the aisle to reach merchandise safely. Ladders project above the top of track 4". One ladder is recommended for every 20 to 30 feet of track. The horizontal distance from the face of the protruding merchandise to the center line of track should be more than 1 1/2" to clear the upper fixtures. Also, brackets should never be installed by screwing directly into the front edge of plywood uprights or shelves because the fastening strength may in insufficient. Please select the mounting bracket type and track height in inches - no fractions of an inch. The ladder will be custom made to your specifications, so please be accurate. All sales are final. This product is non-returnable. C-L10: For fastening on top or under side of shelving, generally with pan head screws. C-L11: Similiar to C- L10, but allows up to 2 1/2" of additional space between track and face of shelving. C-L15: For mounting on front edge of upright. C-L17: Same as C- L15 but provides 1 5/8" additional space between track and face of shelving. 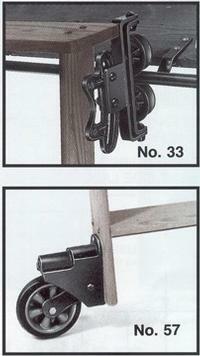 C-L56: For mounting on front edge of shelf where other brackets cannot be used. 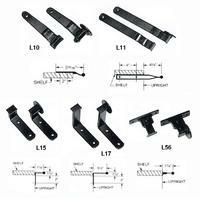 Compatible with C-L15 brackets, can be used as intermediate to C-L15 where uprights are spaced greater than 4 feet. Made in 2 parts for convenience in mounting. C-L56 Brackets are 3-1/2"L x 3/4"H.